The Medieval Fayre, in association with Plantagenet Events, re-creates a summer solstice spectacle. The Medieval Fayre, in association with Plantagenet Events, re-creates a summer solstice spectacle. With hundreds of re-enactors and over 40 authentic traders and artisans, the fayre is one of the most atmospheric events in the living history calendar. Good food, ale and mead will refresh the visitor and revive battle weary troops while music will stir the soul. Travelling traders will sell fine fabrics and wonderful artefacts. 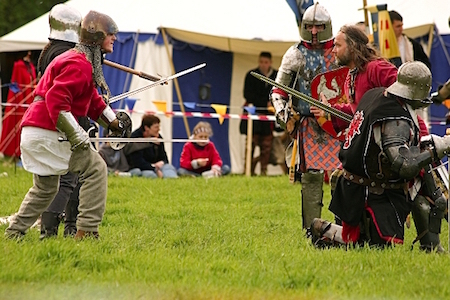 Tatton's historic Old Hall and grounds will echo to the flash of cannon and musket and twang of longbow as medieval warriors demonstrate their skills. Minstrels, mercenaries, men-at-arms, archers, gunners, falconers and a ragtag army of hangers-on add to the atmospheric backdrop. All is not quite what it seems though...despite all the fun of the fayre a jealous neighbour and his army are determined to wrest the Old Hall from its rightful owner! The ensuing Battle of Tatton Field finale each day promises to be exciting and noisy as rivalry comes into play. Whose side will you cheer for? The Old Hall is open for tours. Entry is £7, payable on the day. Car sharing available but if you are making your own way, car park entry charge is £6.